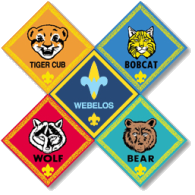 To earn the Wolf rank a Cub Scout must complete the 5 required adventures below as well as 1 Wolf elective adventure. Your scout will need a Wolf Handbook to begin his trail. Below is an outline of the material covered in the handbook. c. c. To keep from spreading your germs. Participate in a flag ceremony, and learn how to properly care for and fold the flag. Talk to a military veteran, law enforcement officer, member of the fire department, or someone else who works for the community. Talk about his or her service to the community. After you have visited with the individual, write a short thank-you note. Name two birds, two insects, and two other animals that live in your area. Explain how you identified them. Find the mint mark on a coin; identify what mint facility it was made in, and what year it was made. which of these sounds is the result of moving air. With your family, den, or pack, participate in a kite derby, space derby, or rain-gutter regatta. Explain how air helps the vehicle move. Make a clean room chart and do your chores for at least one week.